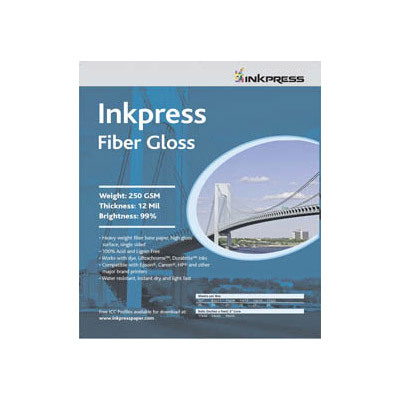 Inkpress Fiber Gloss is a smooth high gloss surface, single-sided paper. It's quick-dry microporous coating offers high opacity and brightness and is optimized for pigmented or dye inks. Inkpress Fiber Gloss is a smooth high gloss surface, single-sided paper. It's quick-dry microporous coating offers high opacity and brightness and is optimized for pigmented or dye inks. Being a fiber based paper, it absorbs inks in the paper better then any RC papers, and gives a beautiful deep colors to the image.